Anju is the daughter of an upper-caste Calcutta family of distinction. Sudha is the daughter of the black sheep of that same family.Sudha is startlingly beautiful; Anju is not. Despite these differences, since the day the two girls were born, the same day their fathers died, mysteriously and violently, Sudha and Anju have been sisters of the heart. Bonded in ways even their mothers cannot comprehend, the two girls grow into womanhood as if their fates, as well as their hearts, are merged. When Sudha learns a dark family secret, that connection is threatened. 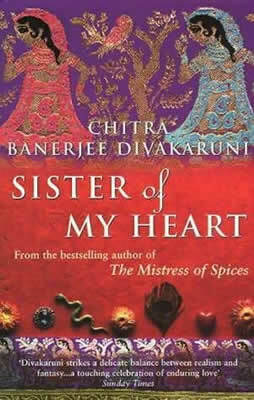 For the first time in their lives, the girls know what it is to feel suspicion and distrust, Sudha, because she feels a new shame that she cannot share with Anju; and Anju, because she discovers the seductive power of her sister's beauty, a power Sudha herself is incapable of controlling. When, due to a change in family fortune, the girls are urged into arranged marriages, their lives take opposite turns. One travels to America, and one remains in India; both have lives of secrets. When tragedy strikes both of them, however, they discover that, despite distance and marriage, they must turn to each other once again. Exceptionally moving, dramatic, and exquisitely rendered, Sister of My Heart is a passionate novel about the extraordinary bond between two women, and the jealousies, loves, and family histories that threaten to tear them apart. Only a novelist of Chitra Banerjee Divakaruni's sensitivity could create a tale as potent as it is poignant, and as true to the complexities of the human heart. "The power of stories and the strength of women who tell them are lovingly rendered ina tale as rich and bountiful as the scents and sounds of Calcutta." "Beautifully blends the chills of reality with the rich imaginings of a fairy tale."